She graduated with a D.M.D. degree from the University of Pennsylvania, School of Dental Medicine in 1996. Dr. Wang also holds an M.S. degree in Oral Science from the State University of New York at Buffalo. 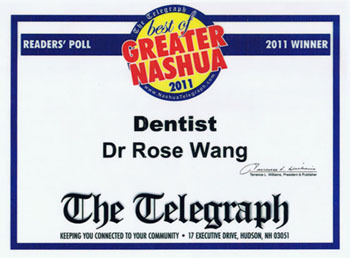 Dr. Wang has been practicing dentistry in Nashua since her graduation. She aims to be an outstanding nashua dentist so that her patients can benefit the most from her technical skills. Dr. Wang has made great efforts to update her knowledge and has over thousand hours of continuing education in the past years. She has focused her training on implant and cosmetic dentistry and her practice enjoys the latest dental technologies. Most importantly, Dr. Wang is determined to follow the highest ethical standards and appreciates the friendship and the utmost trust from her patients and the Nashua community. "Dr. Wang and her staff are incredibly professional, caring, and kind. Dr. Wang is very thorough; always pays attention to our dental needs. Her work and education regarding the most current processes are impeccable! We thank Dr. Wang for being 'The Best Dentist Ever!!'"